Hacksaw Ridge the movie is a true life drama based on the life of a conscientious objector (Desmond Boss) in World War II in the battle of Okinawa. 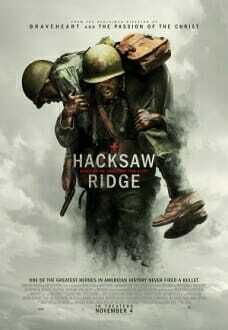 A Lionsgate Production released in November 2016 Hacksaw Ridge is a story of a man who held firm to his religious beliefs no matter what the personal cost was to himself as long as he honored God. Desmond Doss (played by Andrew Garfield) is brought up a strong Seventh Day Adventist and one of the commandments he took to heart as he grew up is the commandment not to kill. Desmond has the desire to serve his country in the army as a medic to save people’s lives instead of taking it. He enlists for the army to do just that he is confronted with pressure from his fellow comrades and leaders to take up arms to go to war. He is beaten up by some of his comrades for the tension created following blanket punishment for his refusal to pick up arms and take a life. Desmond is put under constant pressure, made fun of and told that he is a coward and not fit to go to war with the rest. Being true to his religious beliefs it creates a lot of problems for him and is faced with the prospect of being court martialled and spending the duration of the war in prison. Even his family try by all means to persuade him to just follow orders including his girlfriend Dorothy Schutte (played by Teresa Palmer). Any ordinary person would fall apart when their religious beliefs are put under such a severe test. This world is so corrupted that you may sometimes break your word for fear of being victimised and wanting to make everyone else happy yet deep down inside you know what you ought to do. Through God’s intervention a law unknown to the army commanders comes to the rescue for Desmond Doss. The law allows him to go into battle with the rest of his comrades as a medic without the need to carry any weapon. His only desire is to save life, and not take it. The troops descend on Hacksaw Ridge to do battle with the Japanese who have proved to be a difficult opponent to defeat in the recent attempts. It was coined as the Battle of Okinawa and it was characterised by a lot of bloodshed between the United States and Japan. In one of the battles hope is almost extinguished when most of the US soldiers are killed by the Japanese on Hacksaw Ridge and there are no ready reinforcements to continue battle. This sad state of affairs brings about despair in the US camp and the army commanders also have no idea how best to turn their situation around. Desmond Doss feels the need to go beyond the call of duty and goes out alone in the battle arena with the risk of being killed to search for any survivors. What he does on Hacksaw Ridge is a miracle to say the least and he plays a key role in turning the fortunes in favour of his country. Desmond Doss has since passed on but his legacy lives on and his is a model for us to follow in a world that is corrupted and destroying lives. He was true to his religious beliefs and God honoured him in return. When I first watched hacksaw Ridge I was inspired and challenged at the same time to be more courageous. If you have not watched Hacksaw Ridge get the DVD and learn from his example of courage how he helped his nation overcome the odds. It will change your life.